The Macdonald Houstoun House Hotel is an impressive place. At its heart is a magnificent tower house of great character and charm dating back to 1598. This was sympathetically extended in the 1970s and 1980s into a 70-room hotel complete with extensive conference and function facilities; and a leisure club and spa offering an 18m swimming pool. The surrounding 22 acres of grounds and gardens give a tremendous sense of tranquility, and it is difficult to believe that the hotel is less than a mile by road from Junction 3 of the M8 motorway. This ensures easy access to and from Edinburgh, Glasgow and much of the rest of central Scotland. Add in the excellent Jeremy Wares at Houstoun House Restaurant and you really do end up with somewhere rather special. You can read our dining review for Macdonald Houstoun House here. The four storey tower house that is the hotel's most striking feature may have been built on the site of an earlier dwelling. The oldest building on the site today is the "woman house", occupying the opposite side of a courtyard immediately behind the tower. This probably dates back to the early 1500s and it is thought that Mary Queen of Scots stayed here on at least one occasion. Houstoun House became a hotel in the 1970s and was further extended in the 1980s, at which time the superb ranges of buildings to the north west were added. The result is an interesting complex of buildings that sits very comfortably together. This history has produced a range of public rooms of contrasting character. The spacious and attractive reception area and lounge that sits to the front of the main tower house is very obviously a child of the 70s. The Vaulted Bar, as the name implies, occupies much of the heavily vaulted ground floor of the tower, and wraps around to include the old kitchen. The first floor comprises three rooms created in the 1700s when the castle became a mansion: the dining room (originally the great hall), the drawing room and the library. The three rooms together now form the Jeremy Wares at Houstoun House Restaurant. There are 70 en suite guest rooms in all. Eight of the rooms, the Feature Rooms, can be found on the upper two floors of the main tower house itself, while most of the rest are in the tasteful extension to the north west. Rooms are graded as Classic, Accessible, Executive and Feature. Classic rooms come with all the facilities you would expect of a room in a good four star hotel. Executive rooms give you rather more in terms of space and fittings, while the Feature rooms come closest to encapsulating the true character of Houstoun House. The Accessible rooms match the Classic rooms in most respects, but come with ground floor access, extra space for convenient wheelchair access, handrails in the bathroom, reachable switches and pull-cord alarms. Disabled access at Macdonald Houstoun House is generally reasonable given the design of the core building is a vertically stacked tower house intended specifically to keep people out. Convenient parking is available, as are facilities in the public areas. The restaurant is on the first floor, but meals may be taken in the ground floor Vaulted Bar. Most of the conference facilities are accessible. Houstoun House's central location and excellent accommodation mean that it is very popular during the week for functions, conferences and meetings, while the romance of its setting and character ensures it is also a much sought-after wedding venue. The hotel is licensed for civil and religious weddings. The accommodation on offer extends in size up to the Houstoun Suite, which can accommodated up to 250 for a banquet or 400 as a theatre: while at the other end of the size range, the Dower Room can accommodate 14 in boardroom layout. The hotel also offers guests the use of the Leisure Club and Spa. Here you will find an 18m heated indoor swimming pool, a gym fully equipped with the latest Technogym machines and a spa area offering a range of beauty treatments. There is also an outdoor tennis court, plus gardens and grounds to explore at your leisure. There is something about the idea of a castle converted into a hotel that we always find very attractive, and at Macdonald Houstoun House that conversion has been done with sympathy and style. The character of the original tower house has been retained, the quality of the service is great, the setting is outstanding, and the location is about as central as it is possible to get in Scotland. 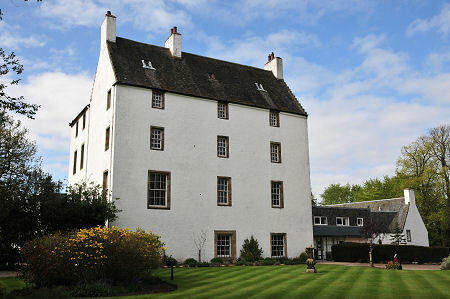 You can read our dining review for Macdonald Houstoun House here.